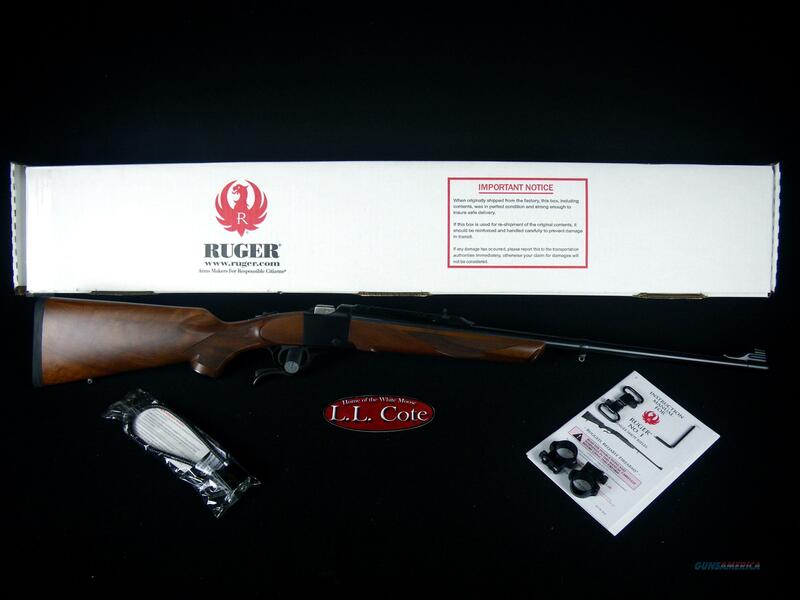 Description: You are bidding on a Ruger No. 1 in 35whelen with a 24"Barrel. Strong, simple, compact falling-block breech mechanism with artillery-style breechblock and under-lever is ideally suited to today's powerful cartridges. Sliding tang safety provides instant security, visibility and accessibility. Cold hammer-forged barrel results in ultra-precise rifling that provides exceptional accuracy, longevity and easy cleaning. Robust and sturdy, sculptured receiver forms a rigid support for barrel, stock and sliding breech block. Integral scope mounts, machined directly on the solid steel quarter rib, provide a stable mounting surface for scope rings (included, Varminter model features scope mounting blocks). Ejector mechanism provides maximum leverage at the point where the ejector engages the cartridge case and can be adjusted to provide extraction only. Also features a sporting-style recoil pad, grip cap and sling swivel studs. Displayed images are stock photos. Any questions please feel free to ask (our phone number is in the additional information tab above).